Are you a real laugh bag? If you are also engaged in a weight loss project, then find the best method to lose some pounds still have fun while doing it. It is a well-known fact that a good laugh can also heal, but according to the latest theories in dieting it seems that this is one of the top practices to get rid of excessive weight. Find out more on the slimming effects of laughing. There were endless studies on how laughing affects our life. In fact it was discovered that this activity doesn't have not even one harmful impact on our body our soul. That's why it is highly recommended by all scientists. However these theories were also projected to weight loss. The results clearly suggest that laughing and slimming ave more in common that we might ever think. Beside boosting our mood it can also increase our ambition to engage into physical activities. These are not the only benefits of laughing however, the suppositions are further attested with numbers and facts. Losing weight might seem sometimes exhausting and painful. Adopting the conception related to laughing will make it bearable and stimulating. Find out more on how to laugh and lose weight at the same time. Indeed exaggerations might find their way when it comes of new theories. However it seems that the slimming effect of laughing conquered the world of weight loss specialists and they seem to confirm it in unison. This doesn't mean that this is enough to get rid of stubborn pounds quick and definitely. Munching and lack of physical exercise is still banned when you aim to follow a healthy lifestyle. However by combining an active life with more laughing you'll be bale to burn fat more efficiently. Believe it or not that your brain will produce the same healthy and stimulating positive chemicals even if your laugh is not completely natural. It might seem bizarre however, if you don't feel like laughing you might still fake it. This way you'll boost your metabolism and organism to enhance the weight loss. So, practice an artificial laugh to achieve your goal. It will help you if you try to remember a funny moment and concentrate. As the laugh intensifies you'll feel the results as the happiness hormones spread all over your body and your energy flows through your veins. Remember it is chemistry rather than a simple theory. It is also worth taking into account that another scientific proof for our theory is that laughing blocks the hormones that are responsible for the stress and gloomy mood. Consequently by applying this trick you'll be able to block the dopamine that is the main culprit for gaining more and more pounds. The brain controls all of these functions why not manipulate it with a fab joke. Laughing equals a good workout session. In fact your body from muscles to organs is perfectly trained during a great laugh. If you'll observe the process you'll notice that the breathing increase, your pulse too and even the body temperature. These are all natural reactions you encounter during a soothing workout session. The blood circulation works at maximum level burning the fat with top speed, more you even train your tummy, back and even facial muscles. There's no need for more than 15 minutes laughing per day to lose up to 5 pounds a year. It might seem less than with an aerobic session, however think about another activity that needs less effort and is similarly entertaining as this one, you won't find any! Think about the benefits of this trick in order to be able to embed it into your daily routine. 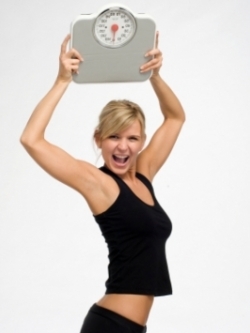 Don't let extra-pounds get you down, when you can fight them with a few great laughs.